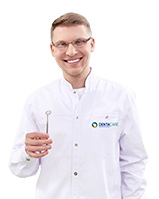 DentaCare / Advice / What is occlusion? Occlusion is the contact between the upper and lower teeth. When the jaw and teeth are misaligned, this is known as an occlusal disorder. If you have worn down teeth, tightness in the muscles connecting the mandible with the jaw, or have problems with the temporomandibular joint, then you may be suffering from an occlusal disorder. popping in the temporomandibular joint (clicking). What are the causes of occlusal disorders? The most common causes are malocclusion, missing teeth, abnormally developed wisdom teeth, and stress. Constant stress causes tooth clenching, which wears them down. Other causes of occlusal disorders are bad habits. For example, pen chewing, using teeth to open bottles, nail biting, and excessive gum chewing. In small children, we should pay attention to prolonged pacifier use and thumb sucking, which can lead to the misalignment of teeth (lips that are tense or don’t fully close). This causes the risk of occlusal disorder to increase with age. 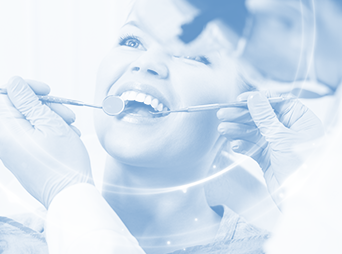 It is also important to ensure that the dental fillings used to treat our cavities are properly fitted. How are occlusal disorders treated? Occlusal disorders can be treated in several ways. The least invasive technique is tooth contouring, such as creating a slight dental superstructure or performing orthodontic treatments. Another option is an occlusal splint (a transparent plastic splint worn at night when tooth grinding occurs the most). In the most difficult cases (e.g. when the chin is too protruded or retracted), orthognathic surgery may be performed. What are the risks of untreated occlusal disorders? Untreated occlusal disorders can cause numerous complications, which can result in irreversible damages to the health. In addition to being subjected to chronic tension headaches, neck and back pain, and even hearing impairments, which will become increasingly difficult to cope with, we can also end up losing our teeth. Therefore, it is important to not underestimate any of the symptoms and discuss any concerns with your dentist.